Mattsquatch Presents: Was this boy saved by a Sasquatch? Casey Hathaway disappeared last Tuesday. He had been playing with two other children in his grandmother’s yard in Ernul, North Carolina, according to Craven County Sheriff Chip Hughes. Casey’s mother gave authorities the same report, that he had a friend in the woods that was a bear, Sheriff Hughes told USA TODAY. Hughes said bears are common in the area, but he thought the comment was more “cute” than factual. I saw that article a few days ago. First thing I thought was that the bear was actually something else. Matt covered it very well. I have to agree and lean towards it was a Bigfoot, probably a female that cared for the boy. I heard this story, bear? Sasquatch. The parents should show him pictures of different animals…including Bigfoot. It would be interesting to know the type of books…tv shows…movies he had been watching lately. Maybe..the little guy was so scared…he made up a bear story to keep him company. I believe prayers were answered….Thank you GOD and JESUS CHRIST for watching over this little boy!!! When I first read about the bear part of his story on Jan. 31, my thoughts went directly to the bear being a female Sasquatch. At 3 years old I would think most kids idea of a bear is a Yogi Bear type cartoon character that walks on 2 legs. This story at first glance has the earmarks of several other child rescue stories I have heard over the years. One took place here in Ohio in the Mohican Forest area maybe back in the 1960s. The only one who would believe the boy was his Kindergarten teacher when the boy drew pictures of his rescuer. Here is another one. June 1868 in the Manistee National Forest east of Ludington, MI. A girl Katie Flynn suddenly goes missing. Search teams that day sent out and suspended at night. The next day a faint cry is heard by searchers. Then a louder second cry. The searchers move towards the cries. The searchers reported seeing a large dark colored, fur covered animal that leaped from the heavy brush into a river. They shot at it. Katie was on a large stump unharmed except some scratches. She stated a big doggie came along, took me in his arms, and walked away with me. He took her to the stump and left her for a while. Then he came back with wintergreen berries in his hands for her to eat. She also stated he scraped together a pile of leaves where they both slept at night. She also said the doggie ate one of her shoes. Here is another. May 1888 disappearance of 2.5 year old daughter of Millard Davis of Boiceville, NY. The NY Times reported the child was found a day later 2 miles away in a deep valley. She stated that a big bear had taken her. It slept beside her at night to keep her warm. She also stated the bear walked on 2 legs. I heard a researcher with a North Carolina Bigfoot organization has reached out to the Mother of Casey Hathaway, but to date have not heard if the Mother would be willing to listen. All it would take really is what Judy S stated, just show some pictures. Do not lead the boy let him describe as best he can. Clyde Lewis also had on his Ground Zero program of Jan. 31 a rescue searcher that stated there is no way that boy lives for 2 days without help. The rescue member himself was bitterly cold at midnight and he was all layered up. Temps reached as low as 18 degrees and a lot of rain and wet ground. Surely he would have succumbed to hypothermia dressed only in light clothes and a light spring type jacket. I wonder IF a Bigfoot takes a child, do they spend a couple of days with them and then realize how needy human toddlers are? Lol, ur probably right Denise…..
Too much work taking care of these human babies..
I’m so thankful he was found alive. Yes, so happy for this boy and his family! Just think, how long can 3 days last? Bet these parents could tell you! I just don’t believe a bear was involved in any way. How many times have we seen gorillas go to the seeming aid of human children? I hope the memory of this special encounter will become ever clearer as he grows up, and it will be recognized as the special interaction it was. the “dam dirty apes” didn’t want him!! I certainly don’t believe a bear helped him. Sounds more like a Sasquatch. I completely believe the child was with a female sasquatch. their own or other youngsters. a bigfoot? I wondering who the child would point to? (New Jersey) As with most of my fellow SC members, I find this to be a very compelling account. I agree that young Casey be shown a “line-up” of various animals in the woods. I think this was very likely a Sasquatch that came to the boy’s aid, and most likely saved his life. This truly is a landmark case- as most adults, much less a young child, could not survive the brutal conditions without proper clothing and supplies. So, we have, Thankfully, a surviving witness. A witness who likely spent two days with a Bigfoot as his protector!! 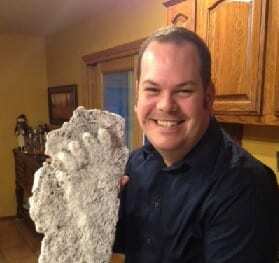 Hopefully his parents will agree to discuss his case-if possible on Sasquatch Chronicles! What could be even more exciting would be hearing from young Casey himself- as he grows older and can tell his tale in his own words. I can’t wait! Also on the other side of this forest is Camp Lejeune a noted marine base. In fact many marines and also from Cherry Point came to search, in fact so many that many that local volunteers were told they were not needed. The Bfro has about four or 5 encounters from Camp Lejeune, and I am most certain they have only made a very slight scratch at the surface. Most soldiers as do pilots will not come forward due to repercussions that is clearly understood. Perhaps ex soldiers from Camp Lejeune or Cherry Point have contacted Wes about their experiences. Perhaps this story has surfaced on this forum and if so excuse me, but I found it to be remarkable. It is of a female Sasquatch coming to the rescue of a 5 year old boy that is being attacked by a full grown bull. In one article I read Casey’s favorite show was Masha and the bear. Every time I see a picture of that bear he is on two feet standing up with hands and such. To the boy he would think of a sasquatch as a bear. Also he was foud in briars and brush. Seems like most children would just walk around this stuff. When they mentioned his clothing there was no mention of shoes. Just a coat and track suit I believe. Also that the terrain was rough. Dogs could not track him. I would love to know how far from home he was and if that area had been searched before. Sounds just like a 411 case. Nice find Debborah Y. I had read he was a Netflix cartoon fan. Perfect – Masha and the bear. I looked at a snippet and indeed that bear is a much more animated Yogi Bear type character. This would be Casey’s frame of reference indeed. Dog could not track him – how can that be. Well maybe because they will not track a Bigfoot or so I have been told by folks that raise tracking dogs. In 2011 in the Huron National Forest of Michigan, Iosco County I took my two large goldens for a walk on Latham road next to Round/Indian Lake. The previous day and night it snowed about 2 feet. Latham road had just been plowed and just before a County camping and boat launch site ( closed for winter ) I saw a set of tracks with no straddle and much more than 3 feet between steps. In fact I could not make one step of the length exhibited, not in this snow. The tracks were much larger than mine with even snowmobile boot. They went off the road about 75 feet and the next step was over a 5 foot fence for a few steps then back over the fence and out to the road. My point is my dogs would follow me anywhere and had been in much deeper snow in drifts in my yard and out in Wyoming that never bothered them. This time they stayed at the road and barked non stop at me for a full ten minutes while I investigated. I tired to quiet them which always worked before, but not this time. Back out on the road they could not wait to run back to my sister/brother in laws lake cabin. The area he was found close to a road had been searched numerous times according to the rescue searcher I heard in my previous statement. To me the briars and brush were sort of a holding area until the two calls/cries went out when a person was spotted coming down the road. I think they were also surrounded by water.